The origins of the Tokyo University of the Arts’ art collection date back to 1887, prior to the foundation of its predecessor, Tokyo Fine Arts School. The collection currently contains over 28,000 items. These art materials were originally known as Bunko (library collections) and were stored at the University Library. In 1949, Tokyo Fine Arts School merged with Tokyo Music School, to form Tokyo University of the Arts. Even after the merger, the art collection was managed by the University Library and has always been an important part of art education and research at the university. In 1970, the Art Materials Section was separated from the library and the Art Materials Archives were established, as music-related materials from the Tokyo Music School era (originally housed in the Faculty of Music) were added to the collection. The staff at the Art Materials Archives has ever since continued to research, preserve, and publish art materials as a joint effort involving both the Faculty of Fine Arts and the Faculty of Music. However, the repository became crowded as the number of artworks increased. This prompted calls within the university for improvements to be made to the deteriorating facilities, and the establishment of an enhanced exhibition space commensurate with the scale of the collection. These calls were answered in 1996, when the construction of the New Building of the Fine Arts Museum began. 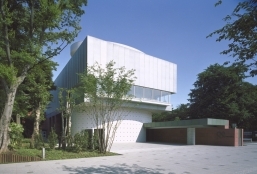 Then, in 1998, the Art Materials Archives were transformed into the University Art Museum to expand both the activities of the facility and the existing organization. The University Art Museum now creates new value by collecting and conducting research on works of art and related materials. In addition, the museum uses the safest methods possible to preserve material for future use. The museum publicizes the results of the arts research conducted through a variety of promotional activities. These activities form the core of the University Art Museum’s operations. In addition, the University Art Museum at Tokyo University of the Arts endeavors to function as an experimental art museum, unprecedented in Japan. The inherent qualities of the arts university provide a unique environment where production, education, and research can thrive.